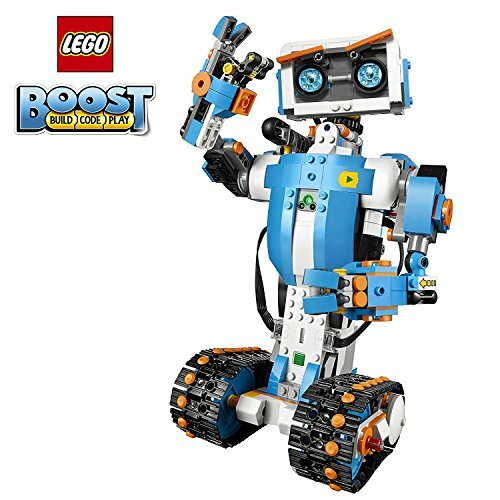 Inspire kids to bring their LEGO creations to life with the new LEGO BOOST Creative Toolbox, the fun and easy entry to building and coding smart toys for boys and girls aged 7+. 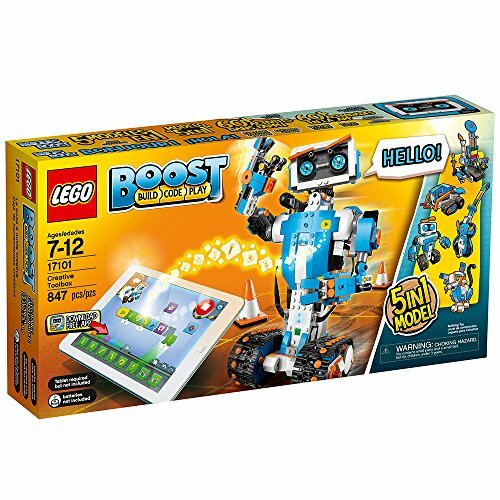 By downloading the free LEGO Boost app and following the step-by-step instructions, kids can learn how to master programming robots all by themselves. Inside are instructions for Vernie the Robot—a moving, talking, and dancing robot, the M.T.R.4 (Multi-Tooled Rover 4)—a robust, versatile rover with 4 different tool attachments including a spring-loaded shooter, the Guitar4000—a musical instrument with pitch bend and sound effects, Frankie the Cat—an interactive pet that plays, purrs, and expresses its mood, and the AutoBuilder—an automated production line that actually builds miniature LEGO models! 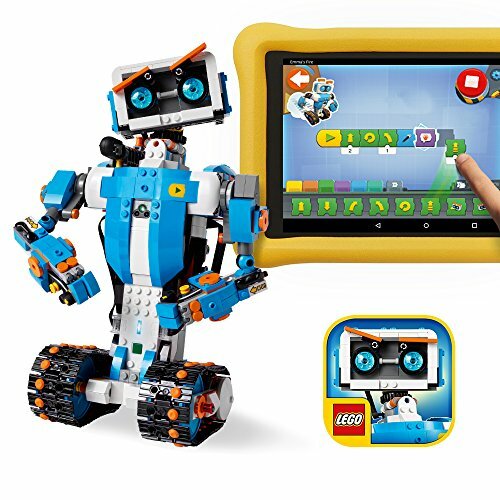 With the app’s intuitive, icon-based coding interface and complete array of exciting activities designed for each model, kids can learn about loops and variables, develop their STEM skills, creatively solve problems in endless play possibilities!Who doesn’t love robots? 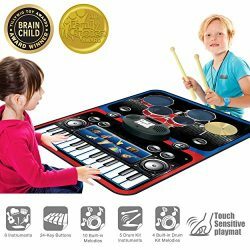 Introduce kids to the creative world of coding with the best educational STEM toys to foster their curiosities. 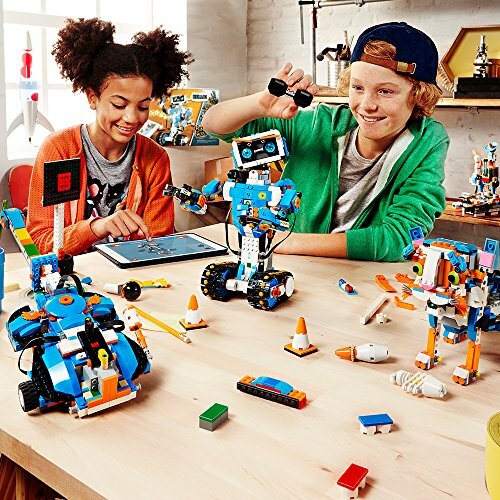 Building, learning, and programming robots has never been more fun! 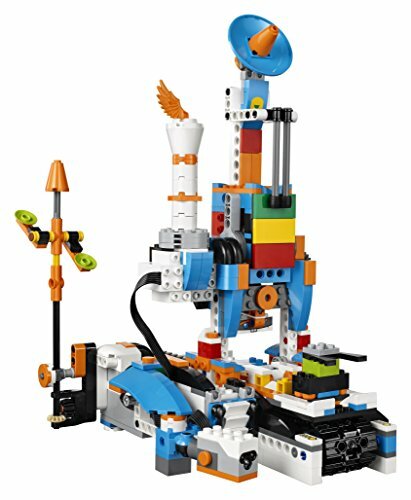 Includes 847 LEGO pieces that kids can build and rebuild into 5 cool multifunctional models. 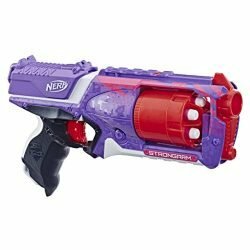 The best and most popular robotics toys for 7-12 year old boys and girls who love to tinker and learn about science. Use the latest tech like color, distance and tilt sensors. 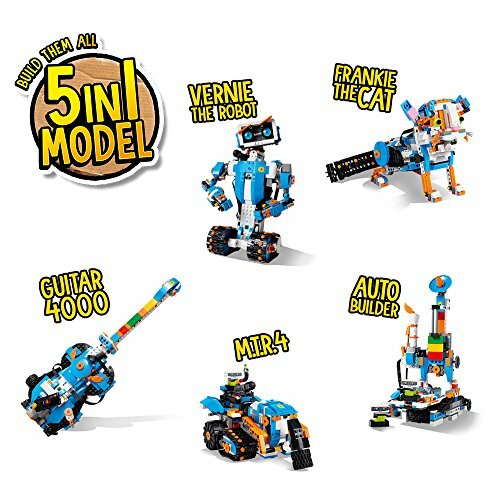 Construct and code Vernie the Robot to dance, rock out on the Guitar4000, foster Frankie the Cat, interact with the Autobuilder, or explore a new discovery with the M.T.R.4 (Multi-Tooled Rover 4). 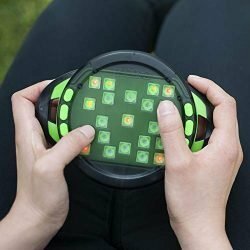 The IQ-boosting activities are endless! 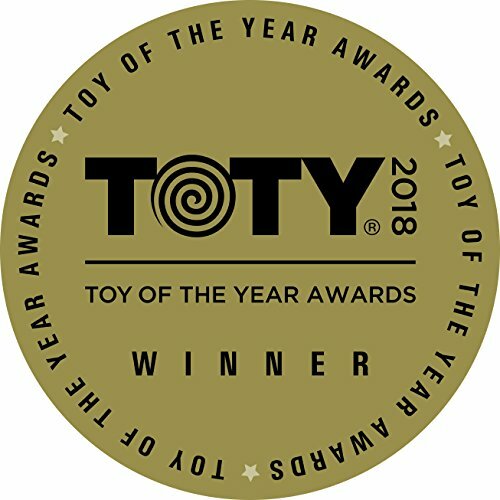 Award-winning toy and the perfect gift for kids and teenagers. 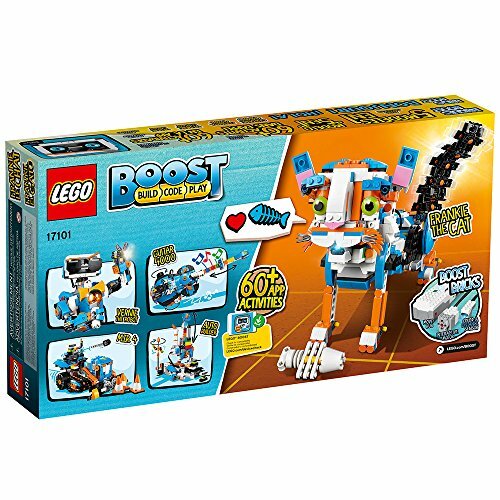 Instructions for all 5 models are included with the free LEGO BOOST app. Download in the Amazon Appstore: amazon.com/dp/B075LL7KGB. 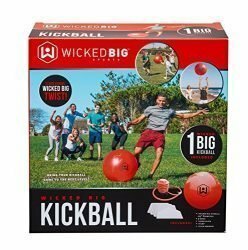 Requires 6x AAA 1.5V batteries (not included). 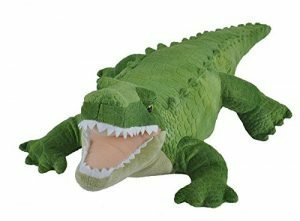 Vernie the Robot stands over 10″ (27cm) tall, Guitar4000 over 1″ (5cm) high, 16″ (42cm) long and 5″ (15cm) wide, Frankie the Cat over 6″ (17cm) tall, AutoBuilder over 10″ (27cm) high, M.T.R.4 over 4″ (12cm) high, 9″ (23cm) long and 5″ (14cm) wide. A tablet or mobile phone is required, but not included. Compatible with selected iOS, Android, Kindle and Windows 10 devices with BLE 4.1 and newer. Compatible with select mobile devices. 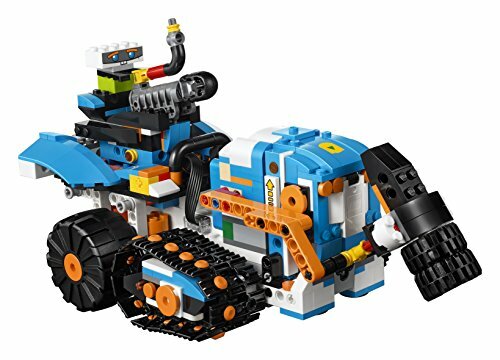 Kids can combine their kit with LEGO City 60194 Arctic Scout Truck or LEGO NINJAGO 70652 Stormbringer and use the LEGO BOOST app to control their own original electronic creations.